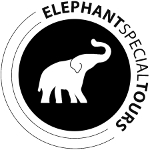 Our currently 10 elephants distinguish themselves by various backgrounds. Their personal experience has formed their unique and own characters which are exciting to get to know to. 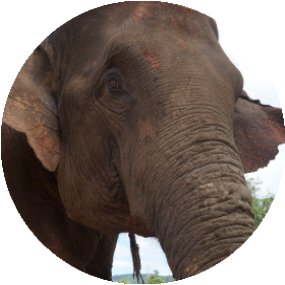 Being only eight years old, Phu Yai is one of the youngest elephants in our herd. 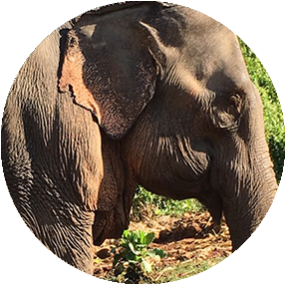 However, he is pretty tall for his age and has the largest tusks of all our elephants, which earned him his name – “yai” meaning “big” in Thai. He is a playful and curious young elephant who loves to splash in the water. 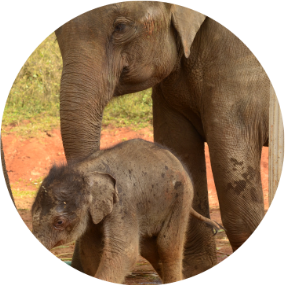 Salia is the first-born calf in the camp of Elephant Special Tours. She was born in 2006 and lives side by side with her big brother Phu Chapo. Both are owned by the Tomali family, to which our camp chiefs Sinchai and Dag belong. Salia is very balanced and communicative. That makes her first choice for our young guests. 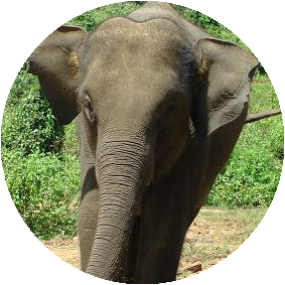 Yaya belongs to our camp since August 2014 and can easily be mistaken for Salia, both of them being beautiful young cow elephants. She soon found friends in Salia and Mae Boonsin. On December 30th 2017, she gave birth to a healthy male elephant calf which can be seen on this picture being one week old. His father Phu Chapo is also always nearby. Phu Chapo is the big brother of our 12-year-old Salia. Even though this 18-year-old bull is not that big, he is bursting with strenght and energy. Right now he is establishing as a breeding bull, not only with our own female elephants but also in others camps in our region. Phu Chapo is still very playful and loves taking a bath in our river. Apart from that, he is not at all inferior to his mature fellows. Mae Mowa is in her mid-thirties and part of our camp since November 2016. Thanks to a generous donation from our guests Abigail Attisso and Claude Hambeck, she will be commited to our project in the long term. Her nickname is “Nong Gee”, which translates to “The Beauty”. Mae Mowa is very balanced and calm and is perfectly integrated into our herd. Mae Gaeo is the grandma and chatterbox of our camp. 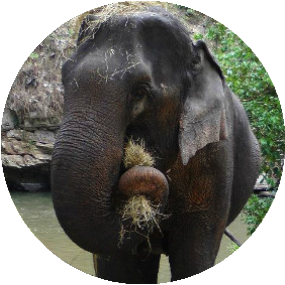 She was probably captured from the wild in Burma where she had to work as a timber elephant in the logging industry. On her body you can see that she has suffered bad things in her life and has not always been treated well by people. 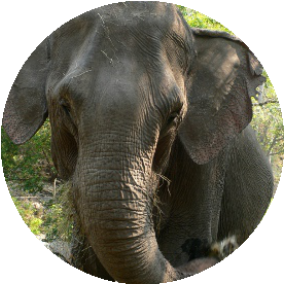 Since she lives in our camp, she has recovered well and is most likely the most sweet-natured elephant in the camp. She tends to draw attention to herself with murmuring and chatting. Before she came to our camp, Mae Boonsin spent most of her lifetime alone in the forest. 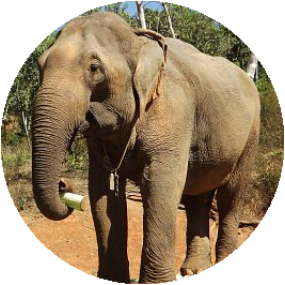 Now she has found many new friends and enjoys living together with other elephants in a herd. She is free to develop and to build up her musculature, which was quite weak when she first came to us. 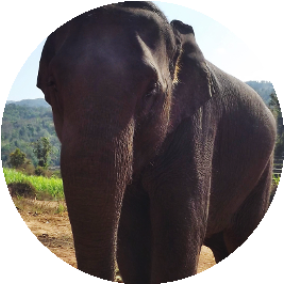 Mae Boonsin is part of the Tong-Bai Foundation and due to her work with tourists in the camp of Elephant Special Tours she does her share to earn her keep at the Foundation. With a height of 3,20m and a weight of more than 4 tons, Phu Sii is the biggest and most impressive elephant in our camp. The bull is in his fifties, used to work as a timber elephant in the logging industry and still knows all the tricks for working with wood. Unfortunately, his tusks were stolen before he came into our camp. He is a colossus of good nature with seemingly infinite power. 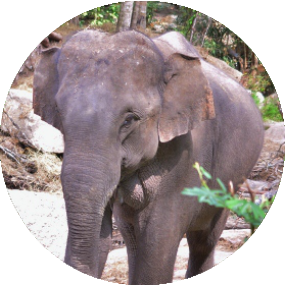 Maybe thanks to her high age, Mae Boontong has a balanced and calm character and is very popular within the herd. Originally, she is from Burma, where she was working as a timber elephant in the logging industry. Therefore she still does very well in pushing wood. She inspects each and every guest that visits our camp and when we take her for a ride, she is always curious and open-minded. Since August 2016 the 17-year-old Mae Bungan is back at our camp. Many years ago, she already spend some years with us as her mother was part of our herd. 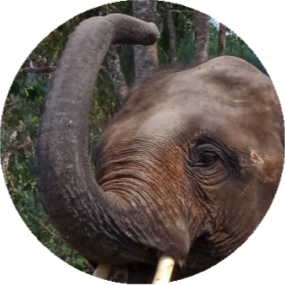 Now that Mae Bungan is back, she got easily into the elephant community, feels good and is friends with all the other elephants. Most of all she sticks to her old fella Phu Chapo.